We are sharing today yet another fabric embroidered logo mockup created with passion by graphicburger. Mockup has one smart layer to insert logo design, either use colored logo design or monochrome outcome of the artwork will look realistic. There is another smart object to place background. Use the image attached to zip archive. 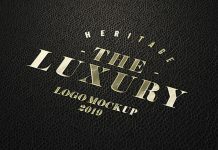 We are sharing premium quality free mockup templates everyday. You can subscribe to receive email updates.